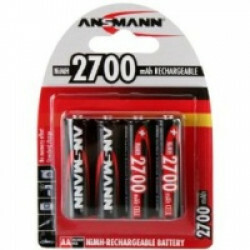 These ultra high capacity Ansmann Global Line 2700mAh AA batteries are designed especially for use in high drain equipment like digital cameras. Replaces AA LR6 R6 HP7 UM3 MN1500 MIGNON. Nickel Metal Hydride NiMH. No memory effect. Recharge up to 1000 times. Ultra high capacity 2700mAh. Four batteries per pack.